The graduation speech of batch 2013-2014 was given by batch-representative Mireya Vazquez-Prada. "Good morning, everyone, and thank you all for attending the second graduating batch of the Beacon Academy’s commencement exercises. I’m sure that many of the juniors in the back over there are about half as excited as we are today, considering the year that lies ahead of them - and some of the parents may be twice as sad, for the very same reason. But I’m certain that no one is quite as nervous as I am - or as honored - to be standing up here, representing the greatest group, twenty-four-strong, that I have had the privilege of knowing. The quick-witted, loud-mouthed, sweet-tongued, lion-hearted, big-nosed – oh, no, wait, that’s just me – the brave, the bold, the beautiful, Magnitude XIV. I like caves. I don’t mean this in the wide-eyed philosophical sense, not in the Plato’s allegory sense, but entirely literally. Though this may seem strange, I like caves because of a documentary that I watched a few years ago with my father, who is sitting in the audience today. It was a part of a BBC series entitled “Planet Earth,” narrated by Sir David Attenborough, entirely the sort of thing my dear friend Jose Fores would not have been able to sit through for longer than a few minutes. I’ve seen the film maybe three times in the past, and there was a particular phenomenon that was captured in it that I have not had an easy time forgetting. If anyone here knows of the topography of a cave, you’ll know that the cave ceiling and floor are littered with sharp rock formations – they look sort of like fangs – hanging straight down and jutting straight up. The formations that point downwards are called stalactites, and those that point up are called stalagmites. What is most amazing to me about these mere rocks is the process by which they are created. Stalactites are formed as water drips from the ceiling of a cave, carrying with it minerals that are dissolved into it. These minerals eventually collect and compact, given enough time, into a single rock. But as this is happening, the water that is dripping from them is building another rock immediately under it. So each stalactite has its own stalagmite, forming with it in unison. I watched this event on film, dumbfounded. And I knew then that if I were ever given the chance to speak on behalf of the unparalleled experience that is forming human relationships, relationships like those that I hold with those whose progression to the next phases of their lives we celebrate today, that I would talk about the stalactites and the stalagmites. Because I’ve learned through time, time spent at this school, time spent with each one of you, student, teacher, staff, that the process of changing, progressing, growing, is not one that is done in isolation. A stalactite cannot possibly increase in size without, in turn, causing the growth of a stalagmite. Likewise, a stalactite cannot cause the growth of a stalagmite without growing in itself. And our growth, my fellow graduates, has functioned the exact same way. For most of my life, I have been a stalagmite on the bottom of a cave, receiving information, increasing the breadth of my knowledge and understanding up towards the sky. But I have seen my stalactites, whether my friends, parents, or teachers, grow along with me, and as fantastic as it has been to watch my own abilities and values slowly develop, what has brought me even greater joy and fulfillment is witnessing you all developing with me, because of me. At the Beacon Academy, we are encouraged. “Encourage;” a word which has come to mean “coax,” or “goad.” But taking the word apart connotes a far deeper meaning. The prefix “en-,” much like in “engrain,” makes the word encourage mean “to instill with courage.” We are instilled, at Beacon, with the courage to identify just who our stalactites and stalagmites are, instilled with the courage to flourish in the role of both. Many of the teachers at the Beacon Academy have joked with their students, proposing the question: Which of us is learning more? Beacon is a place where one can teach without patronizing, can inspire without demeaning, can learn without feeling inferior. And now for you, my dear fellow graduates. In the few ceremonies I have been to, speakers have always concluded their speeches with a little nugget of wisdom. Looking at you know, I can probably count on two hands the number of you whose wisdom I envy, so I am really in no position to give any sort of advice. So, in an attempt to reach a compromise, I’ll instead offer advice that I, too, would like to take to heart. There is a third phenomenon that occurs in a thriving cave. Naturally, one would ask what happens when stalactites and stalagmites have grown so large that they eventually meet. No, they do not stop their growth – they continue on, business as usual, forming a column that grows in thickness with every passing day. Every single individual here has taught me so much, forming the foundations of my being like the foundations of a cave, making what began as my own and was has been imparted on me through time indistinguishable, creating a constant exchange of material – whether it is knowledge, memories, or minerals – that neither time nor distance can weather away. And for that, as my friend Ino Acosta said yesterday in his beautiful induction speech, “I am very thank you.” But really, if you were fortunate to be here yesterday, you would know that Ino delivered an incredibly moving speech, and perhaps it is he who should be standing before you. Actually, could you please all join me in a round of applause for Ino, not just for yesterday’s speech but for a year well done as Student Council President. To continue, from you, Michael, I learned implicit differentiation in calculus. Which I have yet to master. On the other end of the spectrum, from you, Tyrone, I learned the value of standing up for what I believe is right, even when others won’t. And somewhere in between, Gab, you taught me how to line dance. And a lot more! In a play by John Guare that the twelfth grade class read this year entitled Six Degrees of Separation, as Louisa Kittredge reflects on the true meaning of success, she claims: “there is color in my life, but I am not aware of my structure.” If anyone here recalls the antics we pulled during this year’s spirit week and Griffin Games, they would be in agreement that this is, without doubt, one colorful batch. So instead, I implore that we work towards being aware of our structure. As we move away from this day, each of us making our way to different places at different paces, I ask all of us to never stop learning, searching, growing. Find as many stalactites as you can; hell, be as many stalactites as you can! But never forget your roots, your structure, your columns. Never forget those with whom you have grown so long that the points where their influence ends and yours begins cannot be identified. Never forget the origins of your beliefs. Never forget those who have formed your very foundation the way they form the foundation of a cave. My dear Magnitude XIV, let us never forget one another. I do not worry that this is possible – Stefano, Ino, Jomai, Bea, Raj, Ines, Celia, Jose, Gab, Ina, Nicole, Ramoo, Michael, Tristan, Chynna, Lala, Parker, Miko, Chris, Ady, Ty, Kai, and Martha – you have not only made my high school life, but you have made me who I am today, and I don’t know where or what I would be without you. Instead, I worry that the relationships I form from this point onward will pale in comparison to the columns that already exist, because I’d like to judge some semblance of my success as a person, as Louisa Kittredge would, by the formations in the cave. From which stalactites do we draw our learning? Which stalagmites, in our own growth, are we influencing? And which are the columns that we will keep and build upon for the rest of our lives? Thanks to you, staff, teachers, parents, and most especially, my esteemed fellow graduates, I know the answer to one of those questions. I’ll let all of you figure out which. Thank you." 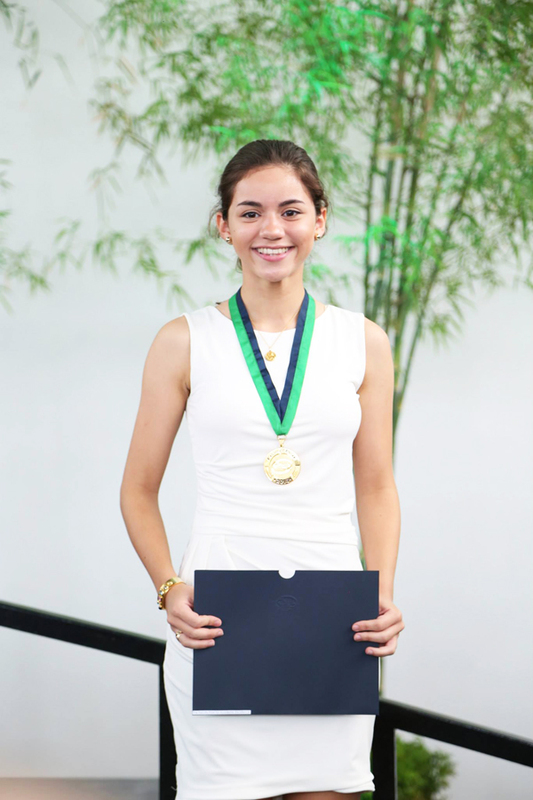 Mireya was also the recipent of Beacon Academy's Virtus Et Ars Award. The highest award given to a Beacon Academy senior who best embodies the ideals, values, and virtues of the Academy for outstanding achievement in all areas of school life. She will be attending the University College London.